there is an Israeli Auschwitz to massacre Palestinians"
Warsaw Conference is "a plan to carry out a 'holocaust' against this [Palestinian] cause"
"Perhaps it is not a coincidence that Warsaw will serve as the site for the convening of this conference"
"This is the just ruse of history, which wishes to remind humanity that the holocausts of racist eradication that Nazi Germany carried out in Poland can happen again today as a result of this American policy." 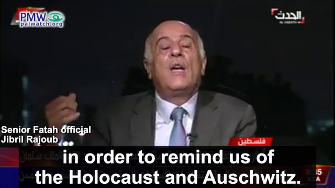 "It wishes to turn Warsaw - as the Nazis did - into an arena of holocaust of eradication against a small, oppressed, and tortured people, the Palestinian people"
Rajoub: "They are welcoming Netanyahu in Warsaw in order to remind us of the Holocaust and Auschwitz (i.e., in Poland). 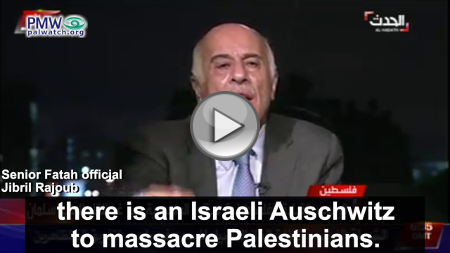 In every city in Palestine, from Rafah to Jenin, there is an Israeli Auschwitz to massacre Palestinians." The Warsaw Conference is a US-sponsored event on Feb. 13-14, 2019, to discuss peace and security in the Middle East. Israeli Prime Minister Benjamin Netanyahu will be attending the conference. The PA was invited to attend but has refused the invitation and requests that Arab countries boycott the conference. "Perhaps it is not a coincidence that Warsaw will serve as the site for the convening of this conference [on] the American administration's failed deal; this is the just ruse of history, which wishes to remind humanity that the holocausts of racist eradication that Nazi Germany carried out in Poland can happen again today as a result of this American policy. It wishes to turn Warsaw - as the Nazis did - into an arena of holocaust of eradication against a small, oppressed, and tortured people, the Palestinian people." "The Fatah Movement emphasized that the goal of the Warsaw plot is to eliminate the Palestinian cause, and that it constitutes an American-Israeli attempt to execute the deal of disgrace and to advance ideas that only those who betray Jerusalem, the Al-Aqsa Mosque, and the Church of the Holy Sepulchre can agree to or cooperate with." Al-Qawasmi: "Any Arab meeting with [Israeli Prime Minister Benjamin] Netanyahu or any type of normalization with the occupying Israeli entity is tantamount to a knife [in the back] of Jerusalem, our people, and the flowing Palestinian blood, a free gift to Tel Aviv, and encouragement for its occupation and its crimes.'" 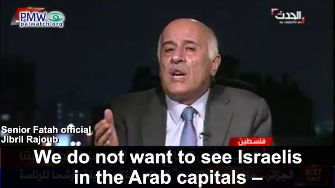 Rajoub: "Once again, we hope that the Arab Summit will emphasize that normalization and ties with Israel - as long as Palestine is occupied - are taboo... We do not want to see Israelis in the Arab capitals - not for purposes of sports, not for purposes of economy, not for purposes of cooperation, and so on. 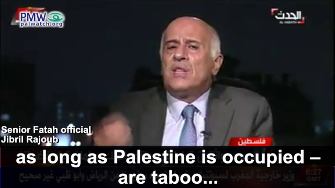 As long as the Palestinian state has not been established, this must remain taboo." 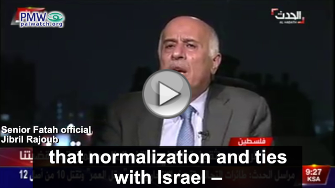 Palestinian Media Watch has documented Rajoub's ban on normalization activities and his support for Palestinian terror in The Rajoub File. "In everything related to the Palestinian issue, the American administration cannot turn Warsaw, the capital of Poland, into Oslo, the capital of Norway... as the legal and sole representative of the Palestinian people - the PLO - will not be there. The [American] administration can't do this. Through the Warsaw Conference it wishes... to establish new alliances for the purpose of false wars and the consolidation of an arrangement for the Palestinian cause, while relying on [US President Donald] Trump's Zionist deal (apparently referring to Trump's as yet unpublished Middle East peace plan -Ed.) as a basis for this arrangement, which is nothing but a plan to carry out a 'holocaust' against this cause, the most just cause of the current age. Perhaps it is not a coincidence that Warsaw will serve as the site for the convening of this conference [on] the American administration's failed deal; this is the just ruse of history, which wishes to remind humanity that the holocausts of racist eradication that Nazi Germany carried out in Poland can happen again today as a result of this American policy. It wishes to turn Warsaw - as the Nazis did - into an arena of holocaust of eradication against a small, oppressed, and tortured people, the Palestinian people." Warsaw Conference - the US is sponsoring a conference in Warsaw on Feb. 13-14, 2019, to discuss peace and security in the Middle East. Israeli Prime Minister Benjamin Netanyahu will be attending the conference. The PA was invited to attend but has refused the invitation and requests that Arab countries boycott the conference. Headline: "Fatah: The goal of the Warsaw plot is to eliminate the Palestinian cause"
"The Fatah Movement emphasized that the goal of the Warsaw plot (i.e., Warsaw Conference; see note below) is to eliminate the Palestinian cause, and that it constitutes an American-Israeli attempt to execute the deal of disgrace (i.e., "the deal of the century," refers to US President Donald Trump's as yet unpublished Middle East peace plan) and to advance ideas that only those who betray Jerusalem, the Al-Aqsa Mosque, and the Church of the Holy Sepulchre can agree to or cooperate with. Al-Qawasmi said: 'Any Arab meeting with [Israeli Prime Minister Benjamin] Netanyahu or any type of normalization with the occupying Israeli entity is tantamount to a knife [in the back] of Jerusalem, our people, and the flowing Palestinian blood, a free gift to Tel Aviv, and encouragement for its occupation and its crimes.'" Headline: "The [Palestinian National and Islamic] Forces in Ramallah and El-Bireh: Whoever is present at the Warsaw Conference is outside of the national consensus"
In a statement, the forces yesterday [Feb. 9, 2019] warned against the attempts to bypass the Palestinian people's legal bodies. They said that anyone who is present at this conference is outside of the national consensus and only represents himself." Palestinian National and Islamic Forces - an unaffiliated coordinating body comprised of representatives from factions in the PLO and outside the PLO. The Palestinian National and Islamic Forces were established in 2000 shortly after the start of the PA terror campaign (the second Intifada, 2000-2005), under the authorization of Yasser Arafat and the leadership of terrorist Marwan Barghouti. During the PA terror campaign it played an active role in coordinating political efforts and terror attacks against Israel, but since the end of the campaign it has been less significant and its activity is primarily centered in Gaza. Majdalani also condemned what is called 'the Warsaw Conference,' for which the American administration is calling, titled Middle East Security,' as what threatens the stability and security in the Middle East is the occupation's terror, which is supported by the Americans; and the path to peace and security in the Middle East passes through the resolution of the Palestinian cause. He again emphasized the call to Arab states not to participate in the summit, and to adhere to the Arab Peace Initiative as it stands." 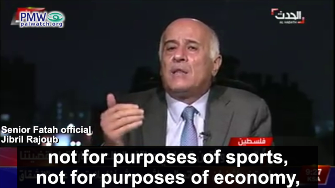 Ahmed Majdalani also holds the position of head of the PLO Department of Labor and Planning. Anti-Terrorism Clarification Act of 2018 - Among other things, this law gives US courts the jurisdiction to seize assets from any body that receives foreign aid from the US government, viewing their acceptance of US foreign aid as consent to US jurisdiction. This enables past and present victims of terror to successfully pursue lawsuits in US courts against such bodies that were connected in any way to the acts of terror. In the past many such cases have been thrown out due to lack of US jurisdiction.